We decided to end the summer with a road trip to Bayfield, WI. We’ve been there several times over the past 5 years, and have always loved it. If you’ve never been, you have to put it on your “bucket list”. For a community of only a little over 500 people, it’s brimming with things to do and see. Fabulous shops and food, too. The boat tours put on by Apostle Island Cruises. Our favorite so far was the “Grand Tour”, which takes you all around the islands–all the way out to Devil’s Island. You can experience the views of the sea caves, lighthouses, and shoreline. This time we tried the glass bottom boat shipwreck tour. Unfortunately, the recent storms/wind created murky water, so we didn’t see anything through the “glass bottom”, but we did have an enjoyable cruise and saw a couple of shipwrecks in shallower water. Cornucopia (at the tip) to hike the trail at Meyer’s Beach back into the sea cave area. The Bayfield Ghost & History Walk is a lot of fun–the guide (dressed in costume) weaves a few ghost stories into the history of the lighthouses and Bayfield area as you walk through town and see the sights at dusk. There’s so much more to do, and we still haven’t taken the ferry to Madeline Island or caught a show at the Big Top Chautauqua. I’d love to kayak the sea caves. And I bet it’s beautiful with the trees turning in fall for the Apple Festival or the Lighthouse Festival. And in the winter there’s the ice caves (if conditions permit). 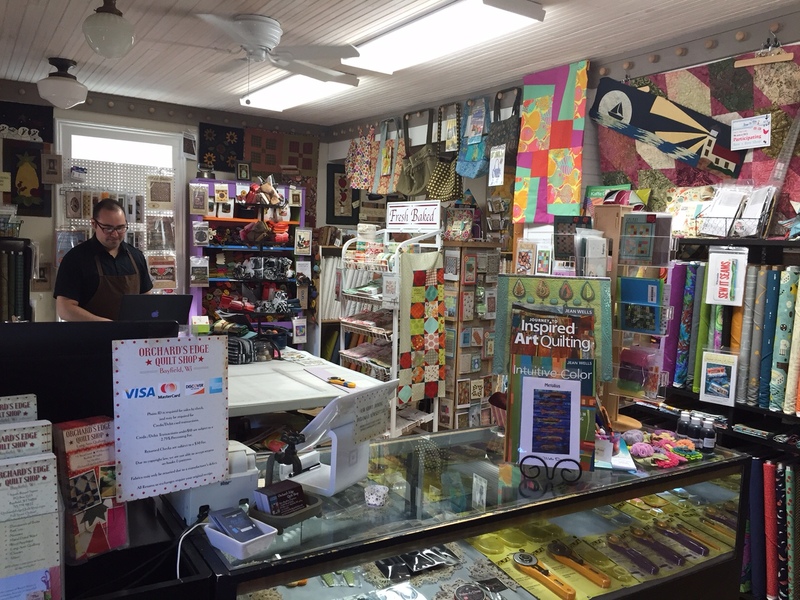 But of course the trip wouldn’t be complete until I stopped at a few of the local quilt shops! 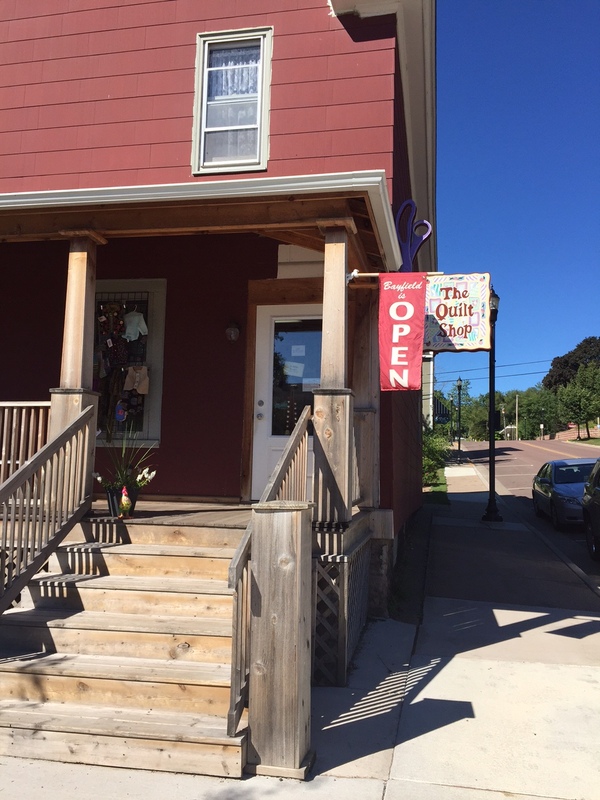 My first stop was at Orchard’s Edge Quilt Shop, which used to be located at the edge of an actual orchard out in the nearby countryside, but has recently moved to downtown Bayfield. It’s the cutest little 2-story building on the corner of Broad Street & Rittenhouse Avenue. Only a few blocks from the docks of the Apostle Islands Cruises and the Madeline Island Ferry, you can see views of Lake Superior from their front door. The store is charming and jam-packed with great inspirational projects lining the walls and shelves. Fabulous fabrics and kits, everywhere I looked I got distracted from all the beautiful things to see. 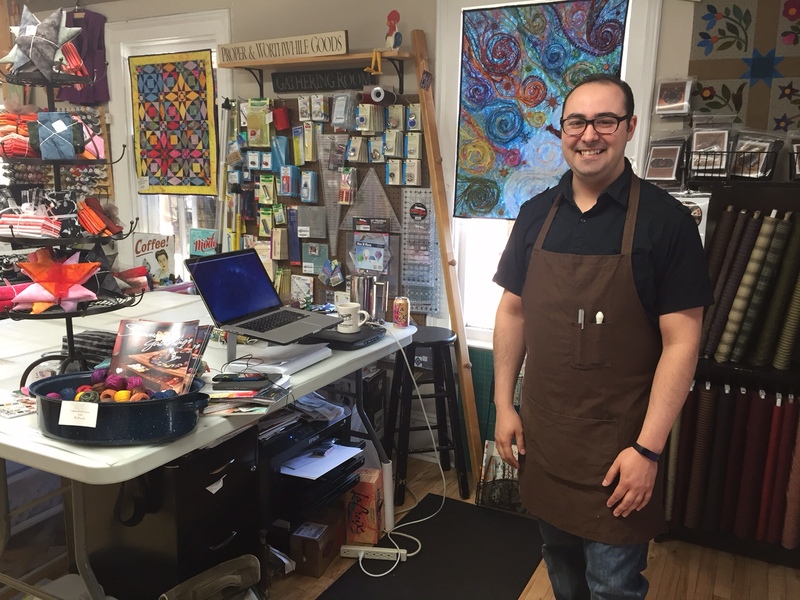 I met Joe, who co-owns the store with his mom. I was so impressed with his quilting knowledge. For example, I was looking for a particular Moda fabric to finish a quilt and just with a description, he knew the name of the line, who designed it, and where it had been in the store (before it was sold out, unfortunately). And we talked extensively about different pattern and fabric designers, several he had met. Front of the shop–lots more in the back. I highly recommend stopping if you’re in the Bayfield area. I’ll share another stop with you on my next post. Until next time, HAPPY QUILTING! 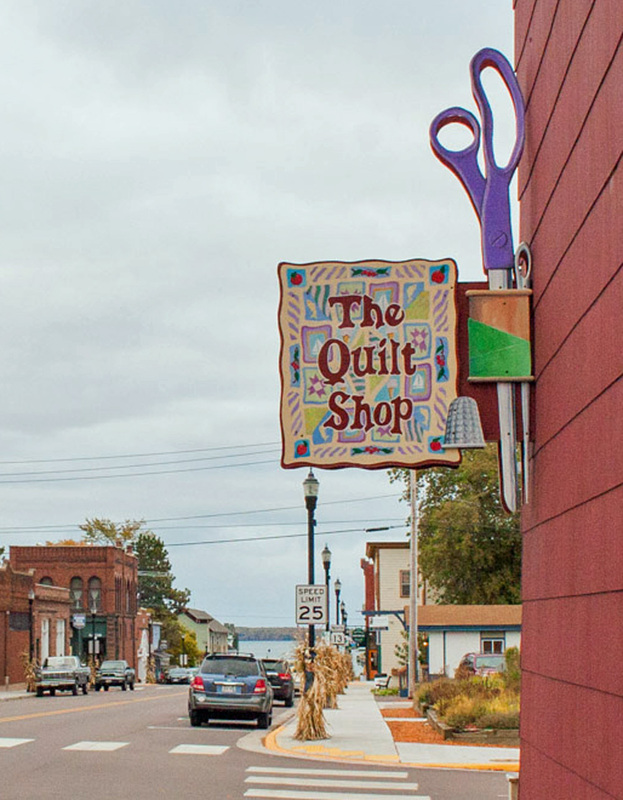 This entry was posted in Quilting Road Trips and tagged apostle islands, Bayfield, mulberry patch quilts, Orchard's Edge Quilt Shop, patchwork, quilt road trip, The Quilt Shop Bayfield, Wisconsin. Bookmark the permalink.